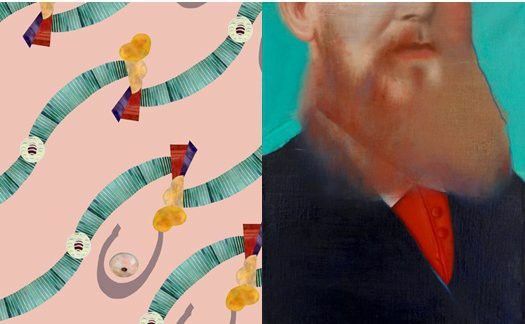 We are pleased to invite you to the openings of two exhibitions od Louise Giovanelli and Jenny Steele. Louise Giovanelli: From Here to Here, is an exhibition in two parts. Whilst Part One (14 May - 18 June) displays paintings selected by the artist from the Grundy's permanent collection, Part Two (2 July - 13 Aug) exhibits new version of these, reworked by the artist. Giovanelli draws on techniques and motifs of Old Master paintings to re-frame and re-cast details from within the portraits into a parallel history of the artist's making, rehanging the space in a ghostly echo of the originals. This exhibition forms part of our 2016 year of programming around the Grundy's permanent collection as well as our commitment to supporting the work of young and emerging artists, in particular those from the North West. An Architecture of Joy, an exhibition of new work by artist Jenny Steele, considers the legacy of inter-War ‘Seaside Moderne’ architecture, such as the Midland Hotel in Morecambe and Pleasure Beach Casino in Blackpool, built during the 1930s leisure boom in Britain. Turning the Grundy’s Rotunda Gallery into a stage-set of sorts, incorporating abstracted and repeated motifs drawn from the period, the artist revives the utopian optimism and restorative properties of seaside leisure.